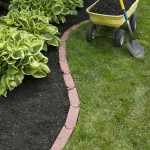 Drip irrigation combined with mulch is an excellent way to maintain high quality of plant materials. Drip irrigation, also known as trickle irrigation or micro irrigation is an irrigation method that saves water and fertilizer by allowing water to drip slowly to the roots of plants, either into the soil surface or directly into the root zone, through a network of valves, pipes, tubing, and emitters. It is done through narrow tubes that deliver water directly to the base of the plant. This allows for fertilizer and nutrient loss to be minimized due to localized application and reduced leaching. Soil erosion and weed growth is lessened with this type of irrigation along with the foliage remains dry, reducing the risk of disease. If drip irrigation is not an option at this time, consider using soaker hoses to provide a good source of water to your garden or bedding plants. Stop by Lochte Feed and General Store in Fredericksburg, TX for all your lawn and garden needs. Speak with our experts and we will find exactly what you need! This entry was posted on Monday, June 20th, 2016 at 9:43 am	and is filed under News & Updates. You can follow any responses to this entry through the RSS 2.0 feed. Both comments and pings are currently closed.